So, it was spring 2007 and I had been running some parts in the last weeks that used more than one tool. With the ER16 collet spindle it's tedious to change tools and resetting Z zero every time. And there's no real good way to get repeatable tool-lengths. I started looking for a suitable quick change system and found one from High Tech Systems that would fit my current ER16 spindle but after careful consideration I decided to not go that route but instead build a new spindle from scratch. I made some research regarding the various toolholders available but in the end I settled for the BT30 because it's small (-ish), it's designed for use in CNC machines, and it's not THAT expensive. It took a while to collect enough information about the dimensions of the BT30 to just be able to start designing. I found some info scattered on various web-pages but also ended up buying a BT30-ER16 collet holder that I could use to double check. 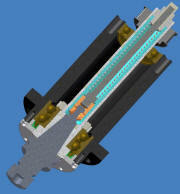 The toolholder is held in place in the spindle by the springloaded drawbar. There's a standard coilspring shown in the 3D-rendering but in reality it's belleville washers providing the "pull" 114pcs of them actually. When the tool needs to be changed a pneumatic cylinder push the drawbar down and compresses the springs. The 4 steel balls in the gripper now have enough room to "let go" of the toolholders pullstud and the tool falls out. 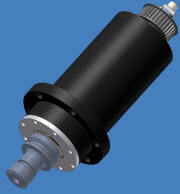 A new holder is inserted and the pneumatic cylinder is retracted. This makes the springs pull the drawbar up and the chamfer at the lower end of the drawbar assembly forces the balls in the gripper to grab the pullstud and pull the holder up into the spindle taper. The 114 belleville washers provide a force of roughly 3000N when the tool is locked and it takes around 4500N of force to push the drawbar down far enough for the tool to drop out. The two lower bearings are angular contact bearings, SKF7207BEGAP to be precise, these bearings are universally matched so by putting 2 bearings back-to-back (DB) or front-to-front (DO) they will provide a light preload. As you can see mine are mounted back-to-back. The upper bearing is a standard 6206 deep groove ballbearing.